It was another Red Bull KTM sweep in round 16 of the 2018 FIM Motocross World Championship, as Jeffrey Herlings and Jorge Prado came away with the overall wins in the MXGP and MX2 classes, respectively, at the MXGP of Switzerland in Frauenfeld-Gachnang, August 19. For Herlings, it was his 13th overall victory of the year and 17th and 18th moto victories of the year. Herlings took the lead away from fast starter Clement Desalle (Monster Energy Kawasaki) in the first moto and never looked back from than point on, taking the checkered flag approximately five seconds ahead of Desalle, who held off former champion Romain Febvre (Monster Energy Yamaha) in third and Glenn Coldenhoff (Red Bull KTM) in fourth. Max Anstie (Rockstar Energy Husqvarna) rounded out the top five. Second in the champion Antonio Cairoli (Red Bull KTM) finished eighth after crashing. Herlings had to work a little harder in moto two. After getting off to a sixth-place start, Herlings steadily worked his way to the front of the pack, eventually finding himself involved in a three-way battle for the lead with Desalle and Febvre. Herlings fought his way around Febvre, then Desalle and quickly pulled away from the duo, taking the checkered flag 14 seconds ahead of Febvre, who worked his way around Desalle, as did Tim Gajser (Honda HRC) late in the moto. Cairoli, who suffered a knee injury in his first-moto crash when his bike stalled over a jump, had another difficult moto and finished sixth. Febvre ended up taking second overall, followed by Desalle, Coldenhoff and Anstie. 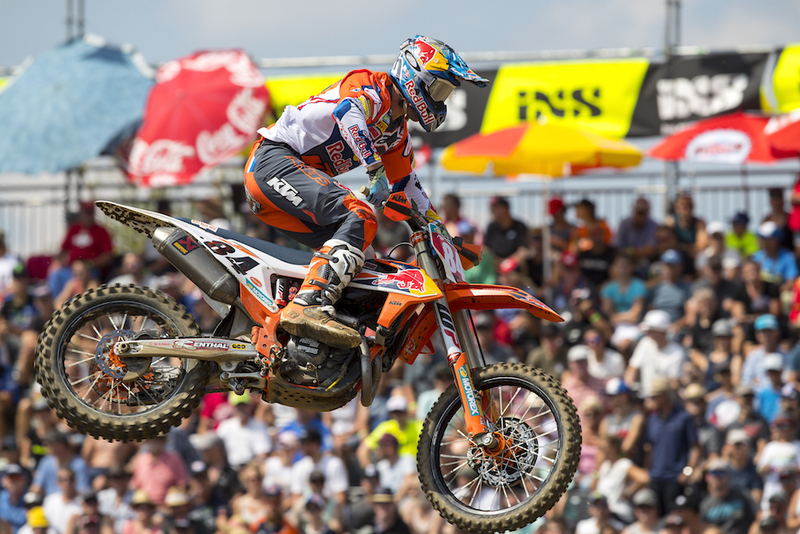 Herlings controls the MXGP Championship with a class-leading 733 points. Next closest is Cairoli with 675 and Desalle third with 543. In MX2, championship rivals and Red Bull KTM teammates Jorge Prado and Pauls Jonass traded moto wins, with Prado getting the second-moto victory and with it the official overall victory. Since both riders traded 1-2 moto finishes, the distance between the two KTM riders in the championship remains the same, with Prado leading Jonass by 28 points. Third on the day went to Australia’s Hunter Lawrence (Honda) with 5-3 moto finishes, and American Thomas Covington (Rockstar Energy Husqvarna) was fourth overall with 3-6 scores. Click here for all the latest FIM Motocross Racing news.